Hypoxia is a frequent microenvironmental stress observed in human tumors. The stress response observed in hypoxic cells results in more aggressive and metastatic cancer phenotypes, associated with poor treatment outcome. 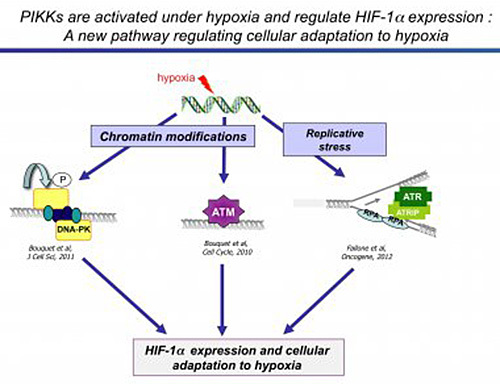 A key regulator of the cellular response to oxygen deprivation is the transcription factor, hypoxia-inducible factor 1 (HIF-1) whose function resulting in the induction of a plethora of target genes that collectively confers cellular adaptation to hypoxia. HIF-1 is comprised of a labile a sub-unit that is mainly targeted for normoxia-dependent degradation by the proteasomal system whereas its beta subunit, HIF-1 beta or ARNT, is constitutively expressed. HIF-1 is considered as an important target in Oncology. We have demonstrated that the DNA dependent protein kinase (a key protein in DNA double strand breaks repair) protects HIF-1alpha against nuclear degradation and favors the survival of tumors cells upon hypoxia. Furthermore, hypoxia induces the activation of DNA-PK in the absence of DNA double-strand breaks (DSBs) suggesting that the hypoxic stress is able to induce a DNA damage like response in the absence of DNA lesions (Bouquet et al. 2011 J Cell Sci). The catalytic sub-unit of DNA-PK belongs to the family of PI3KK a family that, in eukaryotes, initiates cellular stress responses when genome integrity, mRNA translation, or nutrient availability is compromised. We have found that the DNA DSBs signaling protein ATM is also involved in the regulation of HIF-1 (Bouquet et al. 2010 Cell Cycle). Importantly, we recently demonstrated that the ATR protein, which is activated in response to replication stress, also regulates HIF-1 biosynthesis upon hypoxia (Fallone et al. 2012 Oncogene). Taken together, these results suggest that the DNA damage response (DDR) pathway plays a key and unexpected role in the cellular adaptation to hypoxia. In addition, we have recently characterized the interactome of one of the HIF isoform, HIF-2 in melanoma cells. This study unravels a new role of HIF-2 in the regulation of melanoma cell migration and invasion upon hypoxia (Steunou et al. 2012 Mol Cell Proteomics).